What’s Christmas without having gifts? 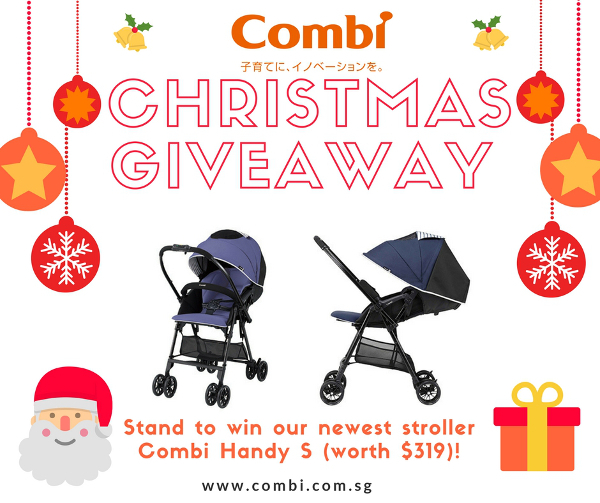 This December, Combi Singapore is giving away their newest stroller – Combi Handy S worth $319 – to one lucky Facebook fan! What’s so special about Combi Handy S? 4) Spacious seat ensures baby feel more comfortable. Available in grey, navy blue and purple. 2. Share this giveaway on your FB profile*. 3. Invite 3 friends to like and follow Combi Singapore Facebook by tagging them in this Facebook post! 3. Name ONE feature of the Combi Handy S and why you would like to win this in the same Facebook Post above. *Remember to set your shared post as public so that the organisers can verify your share. Contents ends 7 Jan 2018.